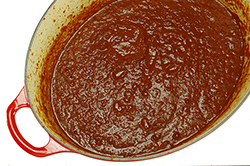 We’re qualifying the name of this chili – we don’t dare to claim to know “the” recipe for Texas chili, so hedging the title with an “almost” keeps us safe from the slings and arrows that might otherwise ensue. We’ve included plenty of beef and peppers, there’s no beans or tomatoes in sight with this chili! Often nicknamed, a “bowl o’ red,” the flavors are intriguing and deep. 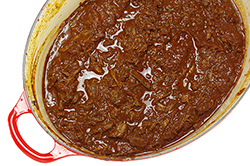 Slowly braised beef cooked to fall-apart-tenderness, is shredded and simmered in a sauce of peppers and aromatics. 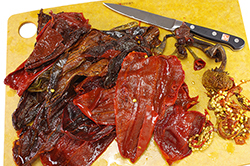 If you’re not familiar with cooking with dried peppers, this is an excellent recipe with which to practice. 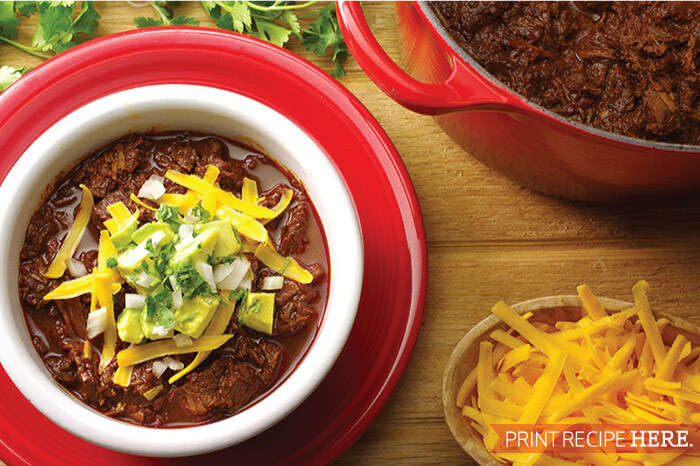 You’ll love the quiet in the room, save for the occasional swoon, as this chili is served. 1. 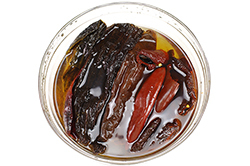 Soften the dried chiles (guajillo, pasilla, and ancho) by covering them with boiling water and allowing them to sit for 30 minutes. Remove the stems from the chiles, split them open, and remove the seeds taking care to retain the fleshy portions. 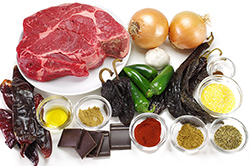 Place the chiles in a blender, or the workbowl of a food processor along with 1 cup of the beef stock. Puree until smooth. 2. Heat the oil in a Dutch oven. Season the beef generously with salt and pepper. Sear the beef pieces in the hot oil turning as needed to brown all the sides. Remove from the pan and set aside. 3. 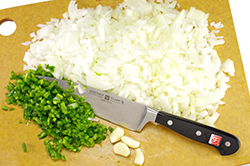 Sauté the diced onions and jalapeño peppers for 3-4 minutes or until they begin to become tender. 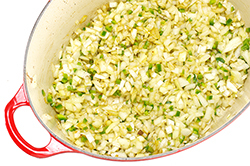 Add the crushed garlic and sauté for another minute. Add the spices (cumin, oregano, smoked paprika, coriander, and cloves. Sauté for another 1-2 minutes allowing the spices to bloom and become fragrant. 4. Add the pureed peppers to the aromatics and spices. Puree with an immersion blender until smooth. 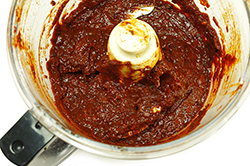 (Or, transfer batches to a blender or food processor and puree until smooth.) Add the remaining beef stock. 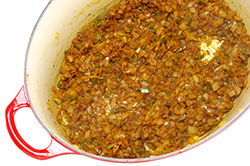 Add the seared beef pieces to the pureed aromatics and peppers. 5. 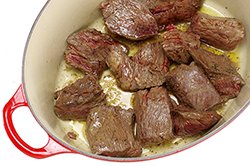 Cover and place the (oven-safe) pot in a 300°F oven for 2-1/2 – 3 hours or until the meat is very tender. 6. 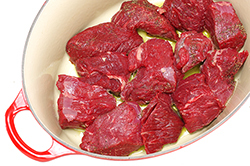 Remove the beef pieces from the pot and transfer to a cutting board. 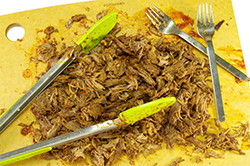 Shred with two forks. Return to the pot. Add the cider vinegar, brown sugar, and chocolate pieces, stir. Adjust spices; adding more salt if necessary. 7. 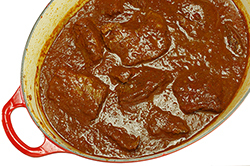 Simmer on the stovetop for 15-20 minutes until the meat has a chance to soak up the red gravy. Serve hot, generously layering on the garnishes.